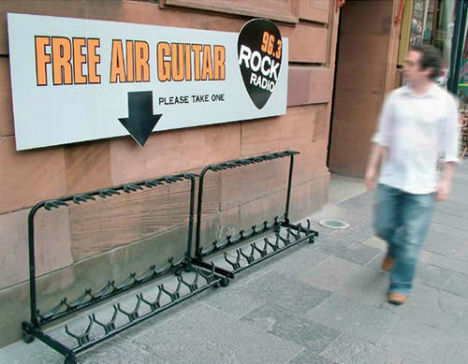 From lively street festivals to the blaring stereos of passing cars, music is a mainstay in urban environments. This series of musical-themed street art, including graffiti by the likes of MTO and fun interactive projects, celebrate that connection. 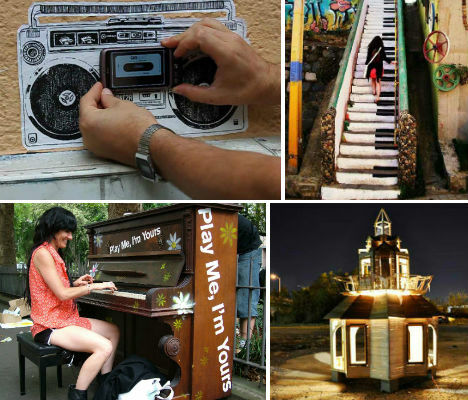 Check out stairs and crosswalks painted to look like pianos, painted stereos that you can play with your iPhone and house-sized art installations with musical instruments built into the walls. 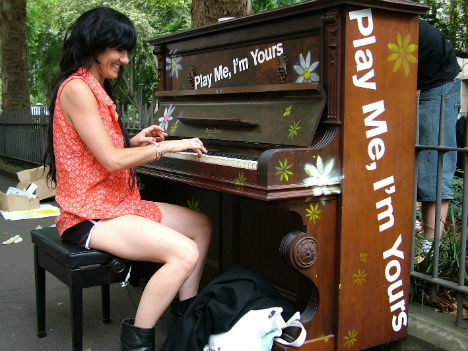 A 2010 installation in New York City saw 60 pianos placed in public locations, emblazoned with the words ‘Play Me, I’m Yours’. The two-week city-wide program kicked off at the Make Music New York festival with the pianos decorated by local artists, students and volunteers. 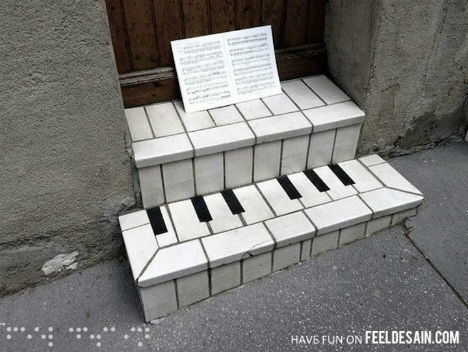 The project gave everyone from professional pianists to people who have never touched keys before a chance to play in public. 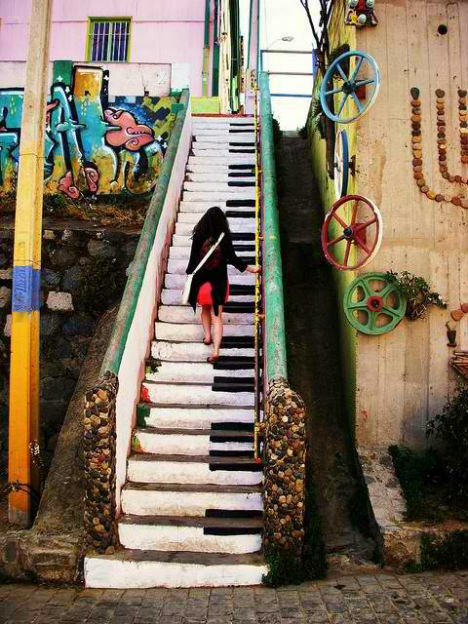 Staircases just beg to be transformed into the keys of a piano. Isn’t it amazing how just a little bit of black and white paint can make a street scene so much more lively? 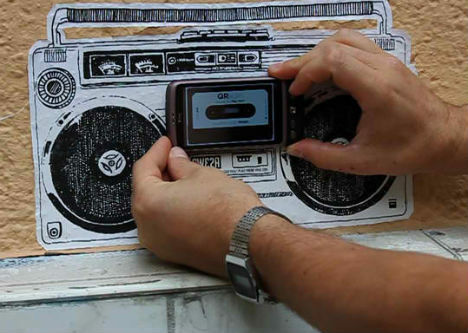 This awesome public art project by the Berlin-based SWEZA enables you to use a smartphone as a cassette tape to make a painted boom box play music. 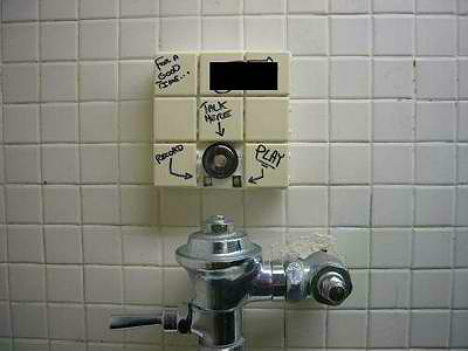 Interactive, imaginative and fun. 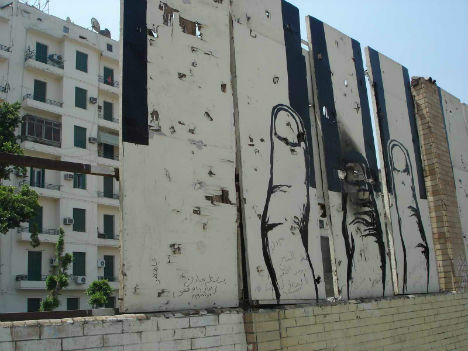 Similarly high-tech, audio graffiti can involve placing magnetic tape on walls, using spray cans to ‘paint’ and ‘play’ sound. Thanks to a tutorial at Instructables, you can even create your own sonic graffiti to transmit and play audio messages to other people in public restrooms. Just what you’ve always wanted. 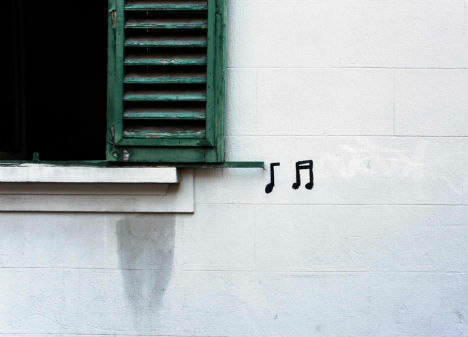 Sweet and simple, a pair of musical notes on a blank white wall send a message without making a sound. 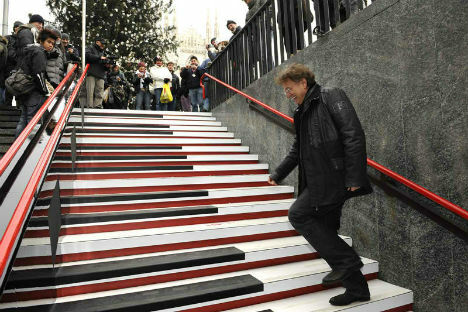 Piano stairs on a smaller scale, this installation takes advantage of the shape of white tiles on a stoop with just a few pieces of black tape. Talented street artist MTO brings musical legends alive on brick walls and other urban surfaces in a series that includes Mick Jagger, Bob Dylan and James Brown. Bringing a little magic to the streets of New Orleans, ‘Dithyrambalina’ is a project orchestrated by Brooklyn-based street artist Swoon, otherwise known as Callie Curry. 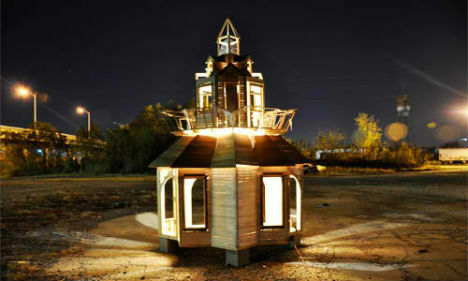 Dithyrambalina is a house-sized musical instrument inspired by the architecture of Creole cottages in the Bywater neighborhood. Local musicians and artists created instruments that were built in to the shack’s walls, floors and ceilings for a temporary public art installation. 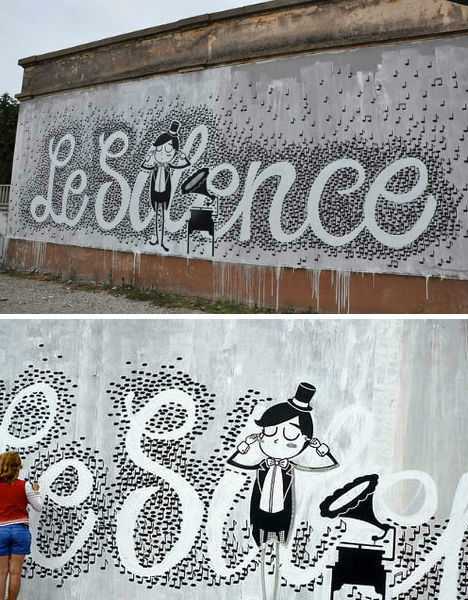 The negative space between musical notes fittingly spells out ‘Le Silence’ in this creative mural by Milan-based street artist Eme, located in Strasbourg, France. 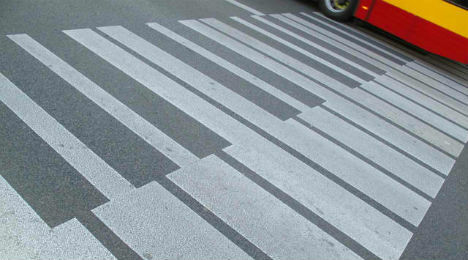 Street crossings in Warsaw, Poland were transformed into stretches of piano keys in celebration of Chopin’s 200th birthday in 2011, a subtle yet powerful manipulation of the urban landscape. 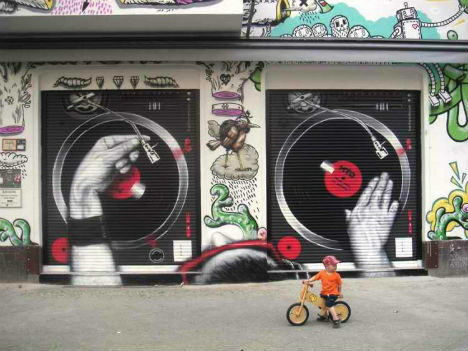 Garage doors become twin turntables seen from above in this perspective-shifting piece by street artist MTO.